Your Family, Agile, and You: Agile and the International Academy of Education. Can children benefit from Agile? Yes, they can! Not only can they benefit from it, but Agile also provides a good ground for learning. So implementing Agile at home with our kids has a valuable learning benefits as well. I’ll give you an example. I found Stella Vosniadou’s ‘International Academy of Education' booklet the other day, and I was amazed at how the board of education study fits Agile principles. So having your kids practice Agile is not only easy and fun, but it is also helps your kids to learn. You can use Agile for studying for exams, getting ready for debates, home schooling and so on. 1. Learning requires the active and constructive involvement of the learner. "Learning at school requires students to pay attention, to observe, to memorize, to understand, to set goals and to assume responsibility for their own learning. These cognitive activities are not possible without the active involvement and engagement of the learner." Encourage the active participation of your kid in the daily gathering. They are the ones actively assigning, moving and taking ownership over tasks. 2. Learning is primarily a social activity and participation in the social life of the school is central for learning to occur. Agile is primarily a social and team activity. We encourage the team to commit, to be accountable. Agile at home isn’t different. The children have a chance to practice their social skills in safety before they go out into the real word. Agile at home is based on the fact that the family is the micro of child socialization, so it acts as a safe zone where they can learn social activities and then to "try" them on in the real world is most effective. We gather as a family, we learn to talk, to present ourselves, we learn to retrospect and we learn to interact with dignity and empowerment. 3. People learn best when they participate in activities that are perceived to be useful in real life and are culturally relevant. Practicing Agile at home, going over relevant day to day tasks, like the Morning Routine, or the Evening Routine, makes a good base from which to build other learning activities. These are highly relevant to the child’s day to day life and can be a good infrastructure to other learning activities along the way, which is also one of the reasons that it works so well at home. Of course, this is only the tip of the iceberg. I highly recommend you take the time to read the entire study, as there are more principles in these booklet statements about motivation, learning curve, which are all interesting to the Agile world. So, how do our children benefit? 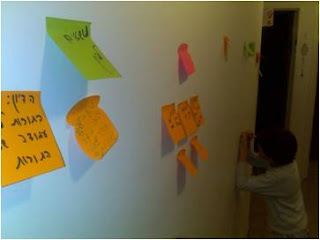 Children use Agile to learn, as it is a good learning and communication tool. They learn how to manage their chores better, achieve better results preparing for their chores and they learn how to plan ahead for complicated tasks, and they learn how to communicate with their parents and siblings. When we bring Agile into our home, we don’t just bring in the boards, tasks, priority and commitment. We take in much more than that. We adopt the mindset. And the mindset proves to be aligned with what helps our children learn better. So what did we take from Agile? ● We took the empowerment principles. ● We took the self management principle. ● The principles of working in a social environment. ● Knowing how to present ourselves. The children manage to communicate better, achieve teaching goals, home chores, learning better and, most of all, we have fun! Want to learn more? The agile kids book.